LONG-TERM STAYS PREFERRED (45-day min). 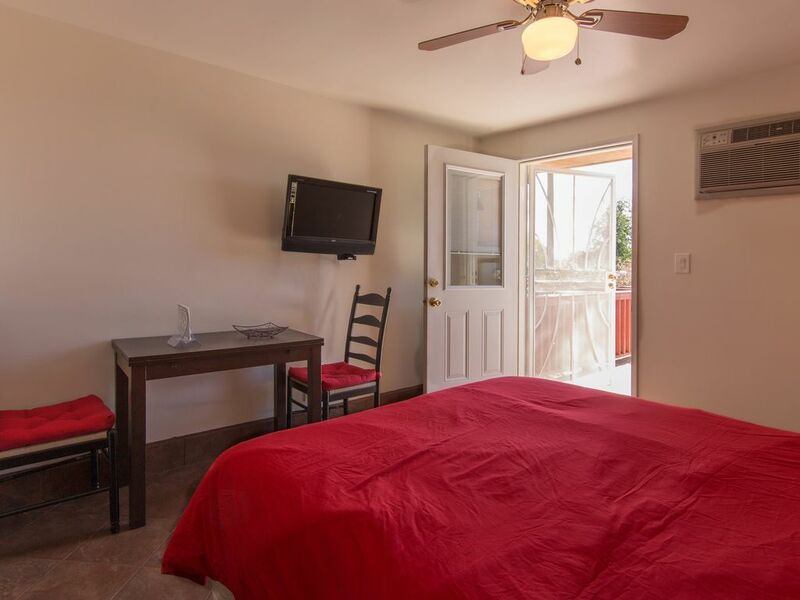 OVERVIEW: Dine alfresco with amazing views, enjoy the fully equipped kitchenette, and even do your laundry while staying at our private, detached efficiency apartment in East San Diego County with its own entrance. Relax and rejuvenate in this private quiet hilltop, in a very quiet and safe family neighborhood (we don't lock our cars at night). Sitting atop a hill with views of San Diego's east county, this space has a mountain-cabin vibe with modern facilities and amenities (see photos). Sleep soundly to the sound of crickets on a new, Queen-size SleepNumber bed, after a nice soak in the bathroom's Jacuzzi tub. PLEASE Inquire (click "Contact Owner"), rather than doing a Reservation Request (Booking). Because we list on 5 different sites, our calendar is not always up to date. We do our best, but because the demand is so high, we get inundated with reservation requests and then get penalized by for declining the ones that are not a good fit. Help us out and send an inquiry first! We promise to respond very quickly! Our typical response rate is 2-10 minutes. THE SPACE: This private efficiency apartment is completely stand-alone, with its own bathroom, kitchenette, entrance, and patio. This unit was recently completely remodeled and is fresh and super clean. You'll feel like you're at home with heating, AC, cable TV, Wi-Fi, and a fully equipped kitchenette - it's large and features a refrigerator, 2-burner electric stove, coffee maker, coffee bean grinder, cutlery, pans, pots, wine opener, can opener, salt/pepper, and paper towels. And we've pre-stocked the fridge with bottled water and fresh Starbucks coffee beans! The single bedroom features a queen-sized bed with a brand new spring-coil mattress and high-quality bedding, a large closet, two nightstands, and two small cabinets to store your stuff. The sparkling bathroom is also stocked with towels, soap, shampoo & conditioner, has plenty of cabinets and storage, and has a Jacuzzi bathtub! There is a washer/dryer on the premises. It is $5 a load, and detergent and dryer sheets are provided. You even have use of our outdoor BBQ (on the main patio). For business travelers, we also offer wireless access to a laser printer and scanner. INTERACTIONS WITH GUESTS: We live next-door and are almost always home. We are just a text message away if you need anything at all. Our family is very friendly and enjoys interacting with our guests. THE NEIGHBORHOOD: Our neighborhood is in the quiet suburbs of East San Diego County, a single-family residential area called El Cajon. It is super safe; in fact, we don't even lock our cars at night. The property is generally sunnier than the coast, while still enjoying easy access to beaches, mountains & deserts. Nearby restaurants, malls, and grocery stores in Santee (7 minutes away). Beach access is only about 25 minutes, on the 52 or the 8. DRIVING: We are just a quick 4 minutes from the I-52 and I-8 freeways, providing easy access to everywhere. TRANSIT: While a bus stop is just a 10-minute walk away, keep in mind that San Diego's public transportation system is terrible; you are far better off renting a car at the local Enterprise car rental place for approx. $25/day. Pacific Beach, Ocean Beach, and Mission Bay. We have traveled to over 33 countries and love meeting new people. While you have complete privacy in your condo, we are right next door if we can offer any help or hospitality! Cozy, affordable, very safe, and private. Only a 30 minute drive from most anywhere in San Diego county. Three years ago, we completely remodeled the inside, so everything is fresh and like new. Privacy, backyard trails, peaceful, tranquil, easy access to anywhere since we are 4 minutes from both the 52 and 8 freeways. Wake up to the sounds of birds chirping and squirrels on your private porch overlooking all of East San Diego. Discounts: 15% weekly discount, 30% monthly discount, and higher discounts for multi-month stays (3 months min) are available. Just contact us and ask. We pay $100 month extra for the fastest speed possible. Fully stocked kitchen with every appliance you could want or need for long-term stays. TV with streaming on-demand movies, TV shows, and more. TV will stream music right off of your iPhone. OTHER THINGS TO NOTE: ------------------------------------------------------------------------------ PLEASE! Before booking, please do a "contact owner". The demand is so high, we get inundated with booking requests and then get penalized for declining the ones that are not a good fit. Help us out and send an inquiry first! We promise to respond very quickly! Because I list on 5 different sites, my calendar is not always up to date. I do my best, but because the demand is so high, we get inundated with reservation requests and then get penalized by this site for declining the ones that are not a good fit. Help me out and "contact owner" first! I promise to respond very quickly! My typical response rate is 5-10 minutes. This is a cute, clean and well-appointed unit, but the space is a bit small, so better for people on-the-go. The hosts were fabulous and made me feel right at home, and graciously responded in a timely manner to all my inquiries and/or requests. You can't go wrong here! Hi Ruby, thanks for your return work trip. Sorry for the workspace limitations. We are still waiting for the new larger work desk to arrive. We didn't expect you to return so soon. BTW - We are really only set up to handle 2 laptops, but there are many co-working spaces nearby if you need more workspace room for your next visit. Glad you liked the unit enough to come back! This well equipped unit is perfect for on-the-go folks! The owners have made sure that all your basic comforts, and more, are met! But it is very intimate in size, so this did not work for my mostly business only trip, where I needed more room to spread out. But it's cute, comfortable, quiet...with a fantastic view and very gracious and accommodating hosts, so you cannot go wrong! Thank you for your feedback! We appreciate every single one of our guests and always take their feedback into consideration so we can make each stay a great one. As noted in the description, the unit is an efficiency apartment, so it is not quite as large as our other units. However, we have never had any issues with space with any prior business guests over the last 4 years. Per your comments though, moving forward, we will be sure to maximize the allotted space available! We will look into replacing the desk with one that can manage 2 people working with 2 monitors each. We hope you enjoyed your stay and thanks for the great review. How can you call it an apartment? It is not big, but this is no apartment. More like a Chateau or condo, or some kind of cute 3 room studio tucked away in a hilltop complex. With a two acre backyard, boulder, trails, and all with 15 min of central San Diego. And all the modern amenities and kitchen supplies. This is going on my "Like" list for sure! Hope to come back next year when the "polar Vortex" hits the Midwest! Very quiet, has a nice kitchen, easy to work in. Had a great traveling doctor stay..
Not much to complain about. The photos speak for themselves. I don't know what to call this. an apartment, duplex, condo. whatever it is, we had a great stay. 2 refrigerators (not big ones) in one huge kitchenette. I like that. So many appliances. The best things of all. Free Starbucks coffee!!! Nice to watch the WWII places from the private deck on the patio! Next extended business assignment I am all over this unit! At first being 20 min from the heart of San Diego was not what I had in mind, but in the end being away from the bustle and traffic and yet have easy access to all of San Diego was awesome! The unit is clean, bright, lots of light, hi-tech, and pretty much what you see in the photos. Love that patio.